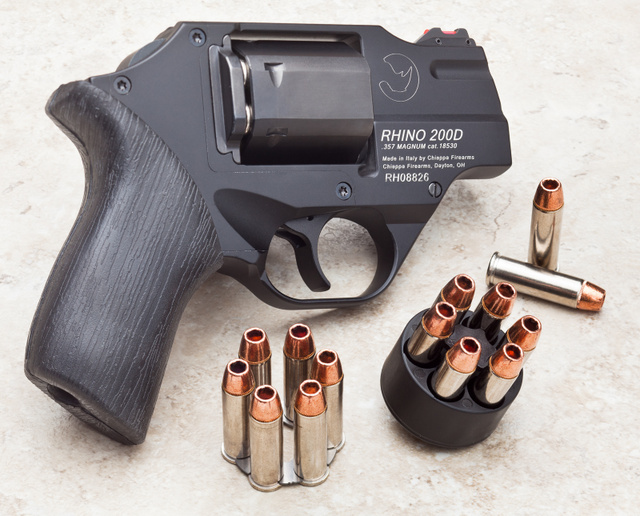 This revolver came in for the upcoming Concealed Carry magazine article about the Rhino revolver family. It’s an interesting weapon that showed significantly better accuracy than expected of snubbies and rather mild felt recoil even with .357 ammunition. Being double action only, it is optimized for the double action pull without a concern for rendering single action too light for safety. All that said, .357Magnum is still a hot round. I have a friend whose hands and arms took too much damage in accidents and left her with much recoil sensitivity. She’s also unable to hold up heavy guns, so her preferred carry arms are a Keltec PMR30 and a 3″ S&W Model 65. I am curious to see if the Rhino would solve some of the issues with recoil. The low barrel placement and soft grips should help. I am having a friend hand-load two different 110gr jacketed hollow points. I also got a box of Magtech 38Spl 95gr all-copper ammo to go with the all-copper Federal .357 rounds. I was going to link to the Lucky Gunner listing for it since they supplied the Magtech box for use as a photo prop…but all of what was on their 38Spl page sold out already. In any case, the theory behind all-copper bullets is higher muzzle velocity and controlled expansion — and my practice with .44Special, .458SOCOM and .223 bullets bore this out. These loads are rated at 1400fps (357) and 1080fps (38), the latter from a 4″ barrel, the former presumably from a 6″. In a 2″ snubbie, 1000fps would be likely — slow enough to keep the recoil and noise down but fast to enough to expand the copper projectile. 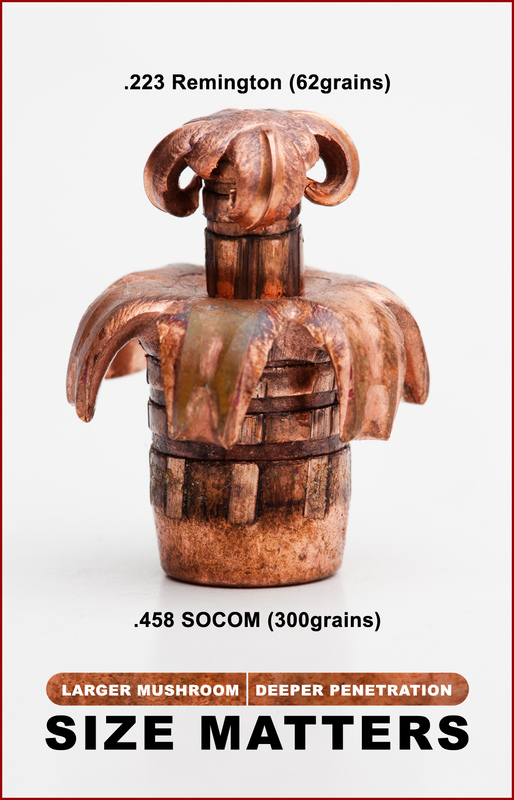 The main down side to copper bullets is higher price than for lead, but these days the difference isn’t all that much. With a fixed sight gun, the real test is to see how close to the point of aim the lighter bullet will shoot. This entry was posted in ammunition, pistol and tagged 357Mag, 38Special, Chiappa, moon clips, revolver, speedloader. Bookmark the permalink. 13 Responses to Minimizing snubbie recoil. I had a chance to handle a Rhino 50DS (5 inch barrel) at a gun show a couple weeks ago. I’ve been intrigued by the idea ever since I first read about them, but hadn’t actually seen one. Much lighter and somewhat smaller than I expected (even the 5 inch model), and I found that the odd-looking grips actually fit my hands well, and the gun pointed naturally. for me right now that’s very much “one day”, but we can dream. It does reduce muzzle flip and felt recoil. Also, because the barrel is more in line with the hand, I find it easier to aim. For deer, you’d want 60DS because it has a top rail for a red dot sight and also slightly higher velocity. I’m curious how that works with the line of sight so far above the barrel, especially at the short ranges at which you would expect to use a snubbie? 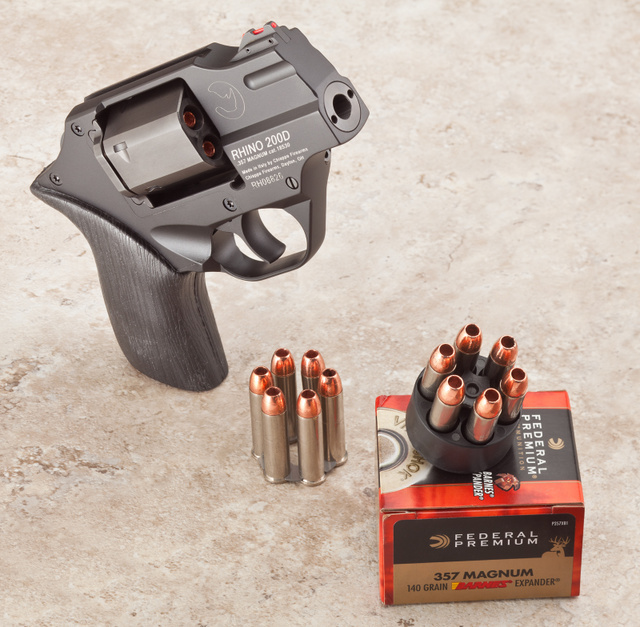 The difference in sight offset between this gun and S&W K-frame is between 3/4″ and 5/8″, hardly critical for defensive shooting. 100 feet per second is rather slow. You need another zero on there, but as I’ve always said; what’s an order of magnitude between friends? A low barrel does neither increases nor decreases recoil. It redirects it backward. Thus you get less muzzle flip. Whether one perceives this as more or less recoil is highly subjective. I’ve had tendonitis problems in my right hand, and guns with a low bore axis tend to HURT a lot more since the recoil is straight back. The more I see of the Rhino, the more interested I get. Aesthetically, it’s ugly, but it’s got a bulldog charm to it that kind of wins you over the more you look at it. How’s the trigger pull? One thing I picked up from my reading when the Rhino was new was that the DA trigger pull was pretty hard, and trying to lighten it with a different spring could bring reliability problems. When I tried the Rhino out at SHOT 2012 the trigger pull varied greatly between the various pistols they had at the range for Media Day as did those at the booth. The reps were very upfront about the crappy trigger pull on some of the guns and claimed that they were early production (they barely got the guns into the country in time for the show) and didn’t have the improved trigger that they had on some of the other guns which were sporting a newer trigger design they were working on. 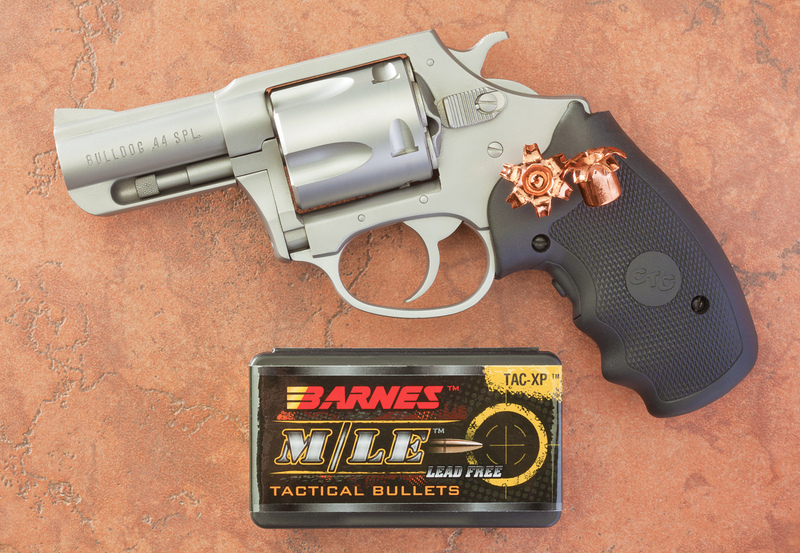 The one I shot at Media Day was excellent and the muzzle flip difference between 38SPL and 357 was barely noticeable…we haven’t got one in yet but I doubt it will make it by me if we do! I got to handle one a while back. I hated the grip. Well…we know why they call it the Rhino…man that little fella is homely/ OTOH they said much the same about the A-10 Warthog and I truly love that plane.